Medical Styrenic Polymer Market size was more than USD 2.5 billion in 2016 and will witness 7% growth over the projected timespan. Robust demand product demand to replace conventional metallic medical devices will drive the medical styrenic polymer market size by 2024. Currently, medical devices are made of metals, ceramics or glass. However, technological advancement has accelerated the replacement pace of traditional materials with plastics, as it provides a broad range of advantages over metallic devices. These advantages include design versatility, lightness in weight, easy disposability, better aesthetics and cost effectiveness which will boost medical styrenic polymer market size in the coming years. Increasing R&D investment in medical industry has led to development of technically advanced medical devices & equipment. Modern medical devices have become functionally more complex and smaller in size. Components such as gears, levers, axels, buttons, actuators and counters also need to be miniaturized, while maintaining high performance, reliability, durability and dimensional stability. These components can be easily micro-molded with plastics to manufacture precision parts with tight tolerance. This will subsequently boost medical styrenic polymer market size over the projected timeframe. PVC is used in the medical and healthcare industries to manufacture devices for the storage of IV fluids, dialysis solutions, blood bags, tubing and connectors. However, increasing impact of PVC on the environment through release of dioxins is changing its market dynamics. In the quest for environment friendly alternatives for PVC, demand for thermoplastic elastomers has increased in almost every end-use industry including medical and healthcare. Henceforth, this will generate growth potential for medical styrenic polymers market size in the coming years. High price of common styrenic polymers including polystyrene and ABS over its counterparts is likely to impede medical styrenic polymer market size during the forecast period. However, increasing geriatric population is likely to generate plentiful opportunities for developing medical devices which in turn will have positive impact on the medical styrenic polymer market size by 2024. Polystyrene has attained the highest share and accounted for over 50% of the total medical styrenic polymer market size in 2016. This is attributed to its versatile properties including transparency and availability in a range of colors along with its application in fairly rigid and economic plastic which in turn will drive polystyrene market size in the near future. ABS are likely to grow at a CAGR of over 8% during the forecast period. This is credited to the excellent product properties including high quality finish & gloss, easily colored, resistant to heat & chemical, easily moldable, etc. which in turn will help attain higher gains for ABS medical styrenic polymer market size by 2024. MBS segment falls under the category of specialty styrenic. It holds a relatively smaller share in the product market for medical applications owing to fewer suppliers for the product in the business. MBS exhibits good impact resistance, high optical clarity and excellent rigidity to toughness ratio which may boost demand for the segment in the coming years. SMMA, is another segment which is derived from combination of polymethyl methacrylate (PMMA) and styrene. It is expected to grow at a CAGR of over 8.5% during the forecast period. This is attributed to easy process ability of styrene along with crystal clarity of PMMA which will drive medical styrenic polymer market size for the segment in the coming years. Medical packaging application is likely to grow at a healthy CAGR during the forecast period. This is primarily due to wide ranging applications including packaging of syringes, drugs, instruments, etc. to ensure safe use and to avoid communicable disease agents in the aforementioned materials in medical application. In addition, stringent government regulations imposed to maintain health & hygiene across medical industry will drive medical packaging segment which in turn will propel medical styrenic polymers market size by 2024. IV solution bag segment is expected to grow at a faster rate over the projected timespan. This is due to increasing demand for IV solution bags in the medical industry owing to its extensive application for containing life sustaining fluids, electrolytes, medications, etc. which offers immediate therapeutic effect. This will subsequently help attain higher gains for the overall medical styrenic polymer market size by 2024. North America attained the highest industry share which accounted for almost 40% of the total medical styrenic polymer market size in 2016. The trend is likely to continue primarily due to high per capita spending on healthcare sector. In addition, improving healthcare standards and regulations has led to shifting market focus from conventional metallic devices & equipment to thermoplastic elastomer which are easy to process and do not have hazardous implications on human health & environment. This trend will have positive influence on the medical styrenic polymer market size by 2024. Asia Pacific is forecast to exhibit promising gains over the forecast timespan. The regional growth will be chiefly attributed to increasing geriatric population and constantly improving healthcare standards due to increasing consumer spending power in the region. This has resulted in innovation across the medical industry by adopting styrenic based polymer which have lower toxicity content which is likely to drive medical styrenic polymer market size in the coming years. 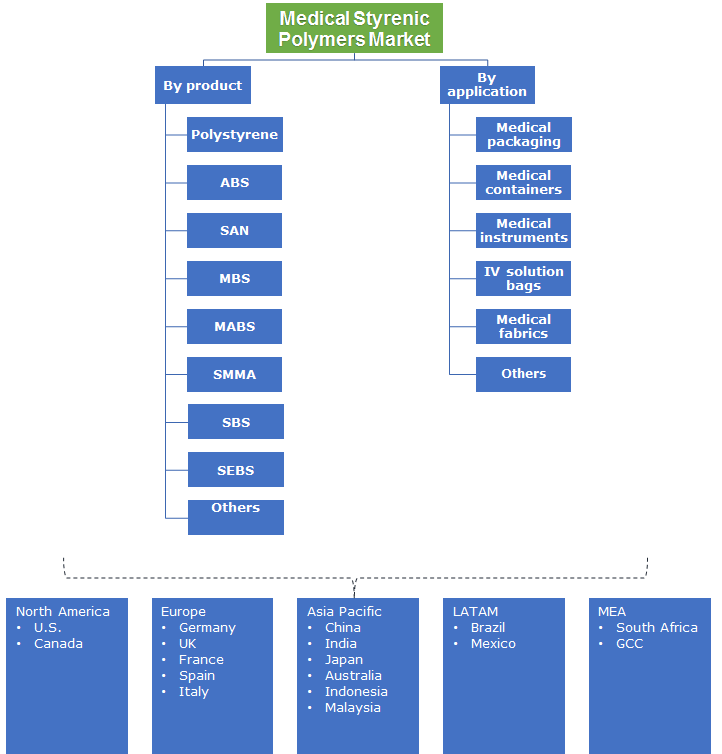 Key medical styrenic polymer market share contributors are Styrolution Group GmbH, Styron LLC (Trinseo S.A.), Chi Mei Corporation, Kraton Polymers LLC, Americas Styrenics LLC, INEOS ABS (USA) Corporation, Saudi Basic Industries Corporation and Chevron Phillips Chemical Company LLC. 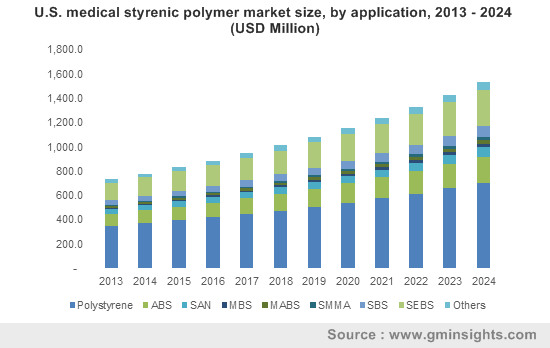 Additionally, the global medical styrenic polymer market share was consolidated in 2016 as top six players in the business accounted for over 45% of the business share in the same year. The industry is forward integrated as the major players including Styrolution Group GmbH, Chi Mei Corporation, INEOS ABS are engaged in manufacturing and supplying product across the globe. Moreover, the key producers are heavily investing in R&D to develop technically advanced and flexible products to be used across wide ranging medical applications which will eventually drive medical styrenic polymer market size by 2024. Medical styrenic polymer has widespread application across medical industry. This is due to desirable physical properties, compatibility with other material and environment friendliness of the product. The several types of styrenic polymer used in the medical industry are polystyrene, SAN, ABS, SBS, MABS, MBS, SMMA and SEBS, of which polystyrene is the most commonly used polymer due to several desirable attributes such as melt flow consistency, color stability, and aesthetics. In addition, growing need for evolving environment friendly technology to utilize in medical industry will subsequently lead to escalating medical styrenic polymer market size by 2024. The product finds extensive application in medical packaging for wrapping syringes, drugs, instruments, etc. to reduce impact of communicable diseases. North America has attained the highest medical styrenic polymer market size due to increasing health standard regulations.